What can you tell me about battery management systems? Found this while tracking down an electrical problem on my brother’s 2016 Focus. What can you tell me about it? My brother (not the one with the Saab, different brother) just had to replace his battery shortly after it was given a clean bill of health from Belle Tire and AutoZone. It wasn’t until I had removed the battery from the car and taken it in for a second third opinion that somebody could confirm that it was junk. 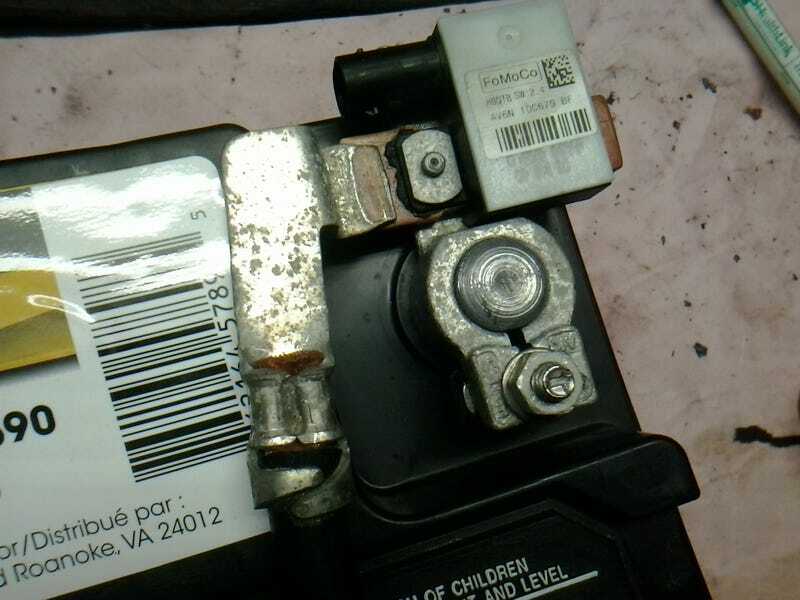 When the battery is in the car, the negative end is hidden, tucked away under the cowl, where this little module thing attaches to the negative post. It’s a non-serviceable, integrated part of the negative cable, which bolts to a nearby part of the frame where there’s a stud that you can clamp onto for jump-starting or testing. The module connects to the wiring harness via a two-pin connector. After my brother left, I did some googling on the part number “AV6N 10C679 BF” on the sticker. Sure enough, Ford considers this whole assembly- including both the cable and this mystery component- to be one “part”. Most search results simply call the whole thing a “battery cable”, but I did find a few listings calling it a “Battery Management System”, which sure is a mouthful for what is surely only part of that management system. I don’t wrench newer cars very much, but I have heard of these systems, and I’m ready to learn more about them. What can you tell me? My initial research informs me that my brother’s new battery needs to be complemented with a reset of the Battery Management System. I suppose disconnecting the battery isn’t enough to accomplish that. Is there a DIY method to resetting it, or does it have to be taken to a dealer? As for that module, I gotta admit I don’t recognize the shape of it. I can see a strip of copper carrying the circuit through the plastic box. What’s inside there? Resettable circuit breaker? Temperature sensor? Oh and BTW, these are the only pics I remembered to take, so here’s a thread on FordForums to see more of what I’m talking about.